The Commission for Victims and Survivors is fulfilling an important role in providing victims and survivors with the right to be heard, to be respected and to have access to the best services available. 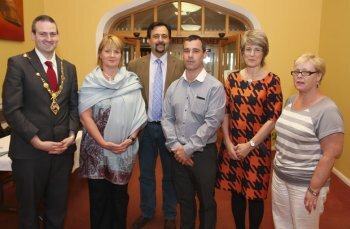 In a keynote address entitled “Engaging, Acknowledging and Supporting Victims in Post-Conflict Northern Ireland” to the 14th INCORE International Summer School at the University of Ulster’s Magee campus, the Commissioner for Victims and Survivors, Kathryn Stone OBE, outlined some of the progress made in recent months. Highlighting the significant and important role of the Victims and Survivors Forum, the Commissioner referred to her 10 months in office as a ‘painful privilege’, echoing the words of one of her predecessors Sir Kenneth Bloomfield. “The members of the Forum bring their very important lived experience. Their views and experiences have proved invaluable to the Commission.Lived experience brings integrity and together, the Commission and the Forum have built credibility,” she said. Forum members, Rev Dr Lesley Carroll and Alan Brecknell gave examples of how the Forum had successfully tackled some issues concerning ‘Dealing with the Past in Northern Ireland’ and identified other issues which still require further work. “However, the fact that this Forum could have difficult conversations about issues such as dealing with the past and agree on certain areas is in itself a major step forward in Northern Ireland for victims and survivors,” said Mr Brecknell. The Commissioner said that that both the Forum and the Commission will continue to work on these difficult and important issues and provide advice to the First and deputy First Minister on how best to address them. The INCORE Summer School is attended by some 40 delegates come from some 10 countries including Nigeria, Turkey, South Africa, Rwanda, Romania, Japan, Belgium, Spain, Denmark, and the United States. They include a group of 12 students from Utah Valley University in the US. The international delegates are joined by local practitioners and scholars for an intense week of reflection on state-of-the art learning and practice in managing, resolving and transforming conflict. The week long Summer School, now in its 14th year, includes modules on ‘Culture and Peacebuilding’ and ‘Peacemaking and Peacebuilding in Northern Ireland’. Past Summer School Annual Public Lectures have been given by the Head of the Community Relations Council, The Equality Commission, and the Human Rights Commission.